Amy Walsh Fitness: The Celebration of Warmer Weather Sale! 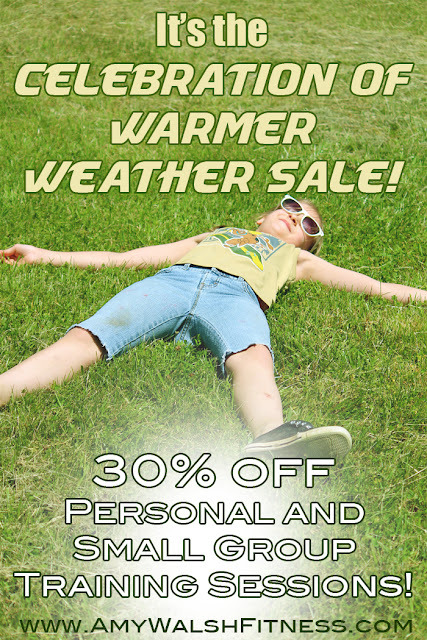 The Celebration of Warmer Weather Sale! In addition to instructing Clearcreek Fitness Bootcamp, Amy is also taking on clients who are interested in one-on-one and small group personal training sessions in their homes or on-site locally. Celebration of Warmer Weather Sale! One-on-One Personal Training Sessions normally $50 an hour on sale now! Four one-hour sessions for $140! That's only $35 a session! Small group (2-4 people) normally $75-$125 an hour on sale now! To check availability, book your sessions or for more information, please feel free to email Amy at: AmyWalshFitness@yahoo/com.